This is “maybe the most interesting presidential election I’ve ever seen,” said CNN Washington bureau chief Sam Feist during a recent talk at the Shorenstein Center on the Media, Politics and Public Policy. The venomous tenor and bewildering twists and turns of this presidential election have led observers inside and outside politics to call it a historic, sea-change race that will be studied for decades. Long-held assumptions about how to win have been upended as celebrity businessman Donald Trump and Sen. Bernie Sanders, a self-described Democratic socialist, sit at or near the top of their primary fields. When it comes to the business of reporting on politics, however, some things haven’t changed. Every four years, complaints about the media’s coverage of presidential elections routinely bemoan a perceived decline in substantive reporting and an abdication of journalism’s watchdog role. With roiling anger and distrust of the powerful animating voters in both parties, attacking the media has become an easy and effective political strategy. Every Democratic and Republican candidate still in the 2016 race has accused the political press of some sort of malfeasance: unfairly advocating for an opponent, pushing grossly inaccurate or misleading reporting, failing to challenge false statements or vague assertions, being overly solicitous of some while ignoring others, or focusing on food fights rather than policy ideas. But some longtime political journalists say that while the profession certainly has its share of lapses, good and important work still is being done. Abramson, who started in politics in 1976 covering the New Hampshire primary campaigns of former Ambassador Sargent Shriver and Sen. Fred Harris for Time magazine, now teaches journalism writing as a visiting lecturer in the English Department at the Faculty of Arts and Sciences. CNN’s job is to provide the best information possible about the candidates to the public so voters can make informed decisions, not to foment or bridge the nation’s growing partisan divide, he said. “It’s not to push the country apart or to bring the country together — that’s up to the country and to the voters,” he said. “I think that taking candidate rallies unedited is actually a valuable service,” giving voters who do not live in early caucus and primary states a chance to see them speak at length. “I don’t think we should interrupt them in the middle of it to annotate what they say,” he said. Sam Feist, who leads the production of CNN’s campaign coverage and debates as Washington bureau chief and senior vice president, discussed the network’s coverage of the 2016 election. While surveys find that public trust in journalism has steadily eroded in recent decades, the appetite for political news hasn’t diminished. In fact, television ratings are up sharply this election cycle, especially for what are often predictable events: the debates between candidates. The Republican primary debate last August on Fox News garnered 23.9 million viewers, an audience three times larger than the previous highest-rated Republican debate back in 2011. Several others have since eclipsed that high-water mark. Interest is also fueling ratings for the Democratic debates, with CNN’s October discussion racking up 15.5 million viewers, up from the previous high of nearly 10 million. Even the so-called “undercard” or “kids’ table” debates for second-tier Republican candidates had twice the ratings, with between 4 and 5 million viewers, of regular debates in previous election cycles, Feist said. Over the last two weeks, CNN has hosted one Democratic and two Republican “town hall” events and will air three more primary debates in the next three weeks. While the nature and metabolism of political coverage has changed dramatically in the digital age, there are some bright spots. “I’m certainly not saying there’s not quality political journalism,” Abramson said, noting that some digital native organizations, such as BuzzFeed, cover politics in a serious and aggressive way. But she said that too many outlets still delight in the superficial — the horse race, poll numbers, gaffes, and other incremental, insider minutiae — over doing the kinds of deeply reported stories she loves, as contained in Richard Ben Cramer’s classic book “What It Takes,” which went behind the scenes of the 1988 presidential election. 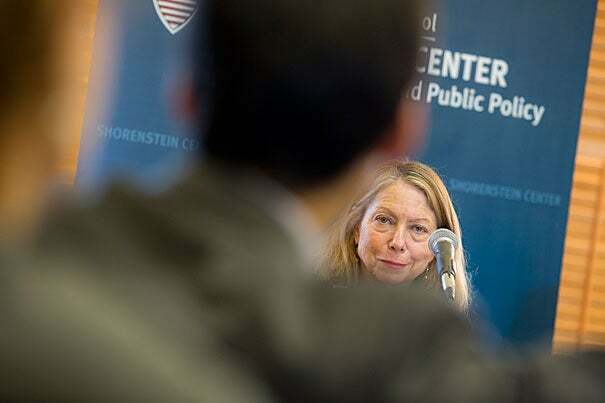 Jill Abramson, lecturer at Harvard and former executive editor of The New York Times, discussed the 2016 election and its coverage in the media – both problematic and promising. "This project is part of a larger effort that Harvard and other institutions are making to clarify and highlight the role that native people played in our history and government,” said Daniel Carpenter, Allie S. Freed Professor of Government and director of the Radcliffe Institute's social sciences program.